Window seats are often one of the most loved spaces in a home. They create a sense of coziness and security, thanks to this little niche that defines a window seat. Sometimes they even provide extra storage when fitted with drawers, cabinets, or a simply hinged bench top. Maybe it’s their ability to take an unused or awkward space and turn it into a charming focal point that warms our hearts. You can find window seats in homes representing just about every American architectural style, from colonial to contemporary, and the fact that they’ve endured this long speaks to their form and versatility. They also have a place in every room, whether as a banquette in the kitchen, a boot bench in an entry, or a hideaway for reading a book in the den, and can be trimmed to match existing moldings. Let’s refresh and organize now that Spring is here! Want to get inspired?? Watch this great video by Ikea. It’ll make you want to refresh your spaces so that they are more organized! If you need help revamping, or would like some help getting creative with your small (or even large) spaces, give us a call at the studio! What makes a house a home?? 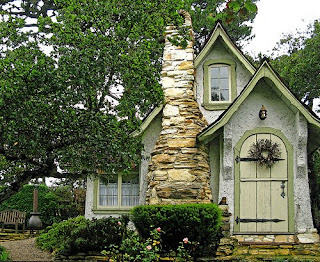 I love this Fairy Tale House in Carmel, California. It is just too cute. The charm that it exudes is magical. Isn’t this what coming home should feel like?